'HULL-RAISER' Jake Connor wants to bring back the biff! 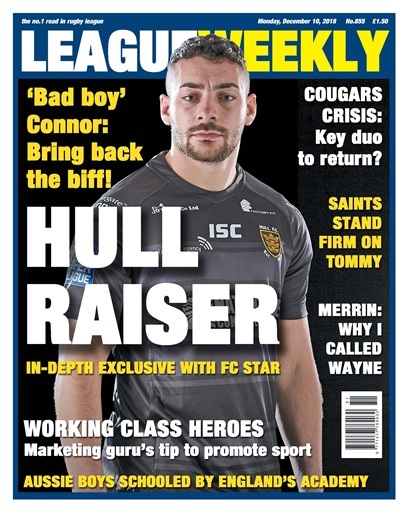 Read our exclusive in-depth interview with the Super League star who loves to be hated - one of the highlights of another packed off-season edition which also includes advice to the RFL from a former RL player turned marketing guru. Is honesty the best policy for the governing body in its battle to market its 'working class heroes'? Saints stand firm over Tommy Makinson ... but will the Golden Boot winner attempt to force their hand? CEO Mike Rush responds to Nathan Brown's comments that the England wing star wants to leave for the NRL. There's news on who may and may not be flying the flag for Britain at the 2019 World Cup 9s, while the RFL responds to Toronto's withdrawal from the Challenge Cup. Could holders Catalans find themselves out of pocket by repeating their historic feat of 2018? There could be good news for Keighley fans as two key figures look set to return. Has the crisis reached a turning point? 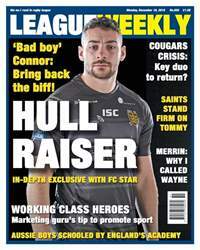 Plus there's the latest on the Widnes takeover bid from the man wanting to buy out the relegated Vikings and re-establish them as a Super League force. Trent Merrin reveals why he called Wayne Bennett before signing for Leeds, plus we catch up with Saints coach Justin Holbrook and Sam Tomkins for Q&A sessions.